If your order weighs less than 13 ounces, save huge on shipping with USPS first class (with tracking number). This product weighs 7.1 oz. Nature’s Sunshine Solstic Twenty-Four offers a full day’s worth of primary nutrition in a convenient, single-serving drink packet. 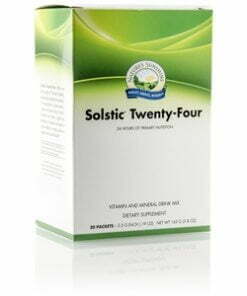 Solstic Twenty-Four contains vitamin D3 for immune, mood and bone support; vitamin K to help with calcium absorption and cardiovascular support; and B vitamins for energy and stamina. 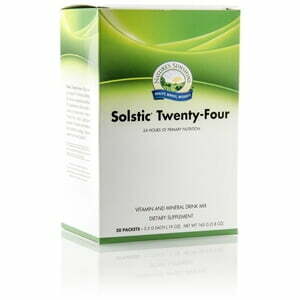 Nature’s Sunshine Solstic Twenty-Four also contains vitamin A, vitamin C, vitamin E, thiamin, riboflavin, niacin, vitamin B6, folic acid, vitamin B12, biotin, pantothenic acid, calcium, magnesium, zinc, potassium. Instructions: Empty the contents of one Solstic Twenty-Four packet into 14–16 oz. of cold water, shake and enjoy. Take one packet daily. scFOS (short-chain fructooligosaccarides), citric acid, natural citrus sweetener, natural raspberry flavor, beet root extract (Beta vulgaris), tartaric acid, silicon dioxide, malic acid, and stevia leaf extract (Stevia rebaudiana).